Alan Forrester, Margaret Haliday, Chrissie White, Isobel Hutchinson, Elizabeth Hutchinson, Sandra Gilfillan.Margaret Elizabeth Stewart,(1) Molly Stevenson, Betty McIver. Margaret Stewart (2) Sandra Morris, Esther Hamilton. Katherine Dymock, Betty Pringle, Marion Ravie, Margaret Aitcheson, Jean McKenna, Margaret Davidson. Peter Irvine, David Pennykid, Tom Steel? Andrew Meek, Francis Gill? John Bonnar, Ian Scott, John Lindsay. Apologies for any wrong spelling. W Putherer, Johnny Dymock ,Ian Lumsden ,?? ,Tommy Davidson, K Walker, Ian Savage, Norman Powell. Jean Gillies, Jean Bradley, Anne Robertson, Margaret Brown, ? ?, K Kitelski, Grace Edgar, Dougal Forrester. David Hutchinson, ? ?, Tommy McFarlane, ? Hutchinson. Some help needed with missing names please. This page was added by Margaret Foster on 04/10/2012. Thank you so much for identifying the majority of the kids in these two photos, I remember most of them well and once I saw their names I was annoyed with myself for not recognizing them. Love this site and check it out as I come in from work every night. I think I am in the second photo front row left. I am born in 1946. I recognise the names S Knox K Walker. I now live in Coventry. From John Lindsay. 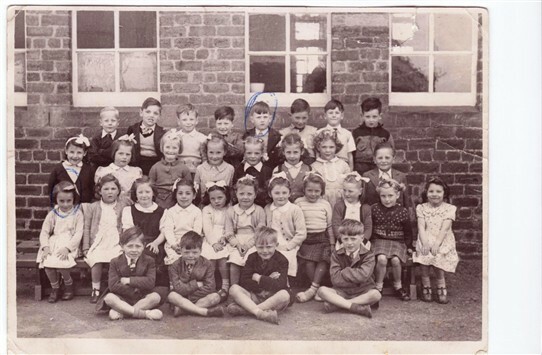 (1st photo, bottom right), yes it is me, the smallest in the class. They would not let me into the RAF when I was 15 because I was so small and light, they did let me in 3 months later and after 18 months training at Hereford, I shot up to 5' 8", spent 14 years in RAF and 15 years in the Army, loved every minute of it, now living in Woking, Surrey after being round the world. Was it almost 60 years ago, feels like yesterday! Hi John. Do you remember you, me and Jean McKenna getting told of about that photograph. Jean didn't hear what the photographer said and asked me. I hadn't heard properly either but thought it was, "girls fold arms and boys hands by sides" you must have overheard us and dropped your hand while Jean and I folded ours. The only three in the class to spoil the picture. Lol. Pleased to see you fulfilled your ambitions in the forces. Like you say it's hard to believe it's all that many years ago. Hi David, I have added your name to the list on the second picture. You did not say what your cousins name was. Do you remember any other names? I can remember the faces but not the names. I believe Esther Hamilton was a cousin also. Hi just came across this site, as my mother in law was from Addiewell, and low and behold, there she is ISOBEL HUTCHISON, she didn't tell us much about her younger years, so if anyone knows her I would love to here from you. My name was Krysia Mietelska and I lived at 43 Meadowhead Crescent from 1950 – 1960, opposite Sandra Knox who now lives in America and with whom I am still in contact. My younger brother Robin’s friends were Bernard Murphy and Patrick ??. Does anyone remember the Italian Coffee Bar in West Calder? Angelina married our lodger Stefan. The Gala Days were great – following the pipe band around the scheme, then running to win a race for money! Friday night the chip van would come and we would have our fish supper treat and, of course, there was Santini with his ice cream! Second Photograph – Back Row: K Walker was Keith Walker. Second Row from Back: My name was Krysia Mietelska, not K Kitelski. 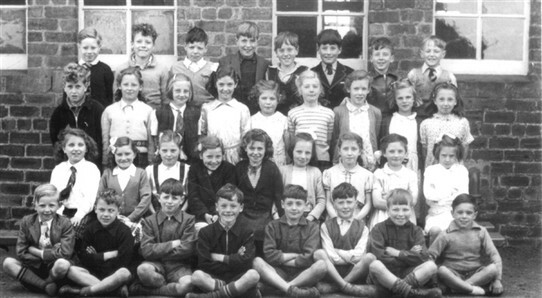 Third Row from Back: The three girls on the right of the row are, from the left, Jean Matson, Christine White & Mary Woods. Two of my teacher recollections from my school days are Miss Henderson, who did not like left-handers (and I was one!) and Miss Arnott, a big lady who slipped down one of the icy slides that had been made more slippery by some of the children – we were all told off but we had a giggle!